Up to Tasso Lake off Limberlost Rd. for a home (cottage) inspection early this morning. We had 12 degrees C yesterday, back to a more seasonal -12 degrees C tonight. But have a look at how beautiful Tasso Lake is on a winter morning before freeze-up. Tasso Lake, soon to ice over. Tasso Lake is only about 2 kilometres from Algonquin Park. 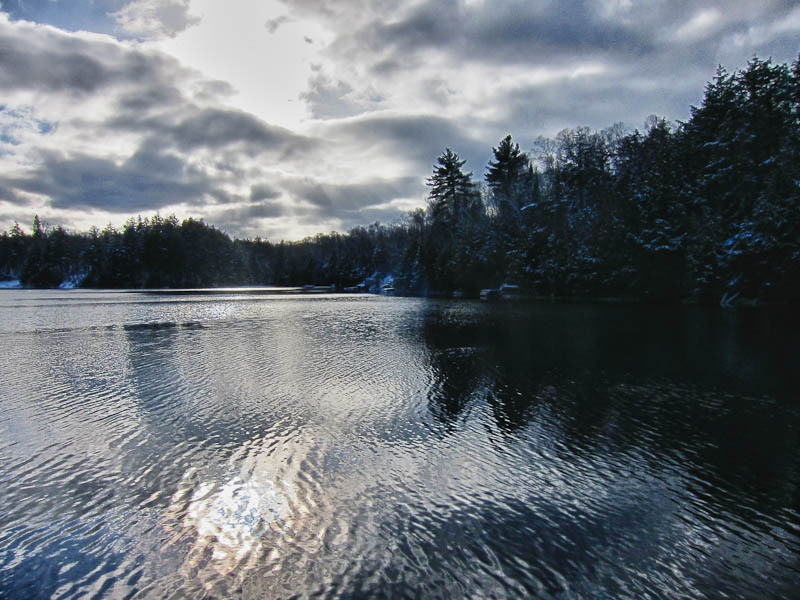 As we have mentioned before, information about the water quality of lakes in Muskoka is available on the Muskoka Water Web; here’s the page for Tasso Lake. "Just wanted to let you know we moved into the cottage last Saturday and met all the neighbours, they all seem super nice. We all had a swim in the lake including Bala. Bala made a friend with Jim’s dog Riley. This weekend we have some friends coming up so we will be able to relax and enjoy. Thanks for all your help and making things go so smoothly. It was a pleasure working with you. Can’t wait for you to come and have some wine with us!